Founded in Milwaukee in 1929, the Bavarian Soccer Club is one of the country’s oldest soccer clubs. It serves boys and girls with development programs for players ages 4 all the way through college and onto adult competitive and recreational soccer. Youth teams from the Bavarian Soccer Club have won numerous State and Regional Championships. The Club’s adult teams have won six National Championships in both Amateur and Open Cup play, a record for Wisconsin-based clubs. The Bavarian Soccer Club has produced hundreds of coaches who have gone on to teach the game in community based programs throughout the United States, NCAA Division I, II, III, NAIA, Major League Soccer, international leagues, as well at the US Soccer National Team level with Coach, Bob Gansler. Founded on July 29, 1929 at Milwaukee's Lake Park under the name Fussball Club Bayern, the founding fathers originated from the province of Bavaria in Germany. The Club supported sports for men and women in bowling, fist ball, tennis, swimming, pyramid groups and soccer. 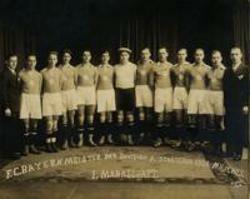 The first soccer game was played on September 29, 1929 against Sheboygan F.C. and resulted in a 3 - 2 win for the Blue & White. F.C. Bayern won 7 state championships in its first thirty years of existence. In 1956, the Club's name was officially changed to Bavarian Soccer Club, Inc. and a new field site was purchased. The Club also narrowed its focus in sports to concentrate on soccer. The focus and concentration on soccer only, has paid off richly. In the late 1950's, the Bavarian Soccer Club also began to build and secure the foundations of soccer for youth in the Milwaukee area by actively developing its youth program. During the last 40 years, many youth players have reached state, regional, and national championships through the Bavarian youth program. The 1960's became the golden years for the Bavarian Soccer Club. The men's major division team won an unprecedented seven consecutive Wisconsin major league state championships from 1960 to 1966. This feat has not yet been repeated by any team in the Wisconsin Soccer Association. To date the major team has won 30 league championships. The Bavarian major team won its first National Amateur Cup championship on their home field in 1976. The game was played in Milwaukee against Trenton New Jersey. The final score was 3 - 1. The major team came close to earning its second National Title on several occasions. The team reached the national finals in 1983, 1994, 1999 and 2000. Finally, after two consecutive defeats in the National Open Cup final, they secured the National Amateur Cup. In 2001, on the 25th anniversary of the club's first title, the Bavarian Soccer Club brought the National Amateur Cup title back to Milwaukee. The finals were played in Orlando, Florida. Bavarian S.C. defeated Sporting F.C. from Santa Clara, California 3 - 2. Over the years, numerous members of the Bavarian Soccer Club have been inducted into the Wisconsin Soccer Association Hall of Fame, as players and coaches, in recognition of their significant contributions to soccer in Wisconsin. In 2000, the WSA presented the Bavarian Soccer Club with the Mike Kabanica Memorial Award for outstanding continued work for the "Good of Soccer" in Wisconsin. The 2011-12 season saw the club's introduction of its Girl's Division. Prior to that time the club had many girls training on complex and playing on its teams, this was the inaugural season of the fully developed and staffed girls division. Currently, the Bavarian Soccer Club supports teams for boys and girls from ages over - 6 to under - 100.